Valid for orders shipped via ground service or equivalent within the 48 contiguous states; does not include express shipping or shipping surcharges on special items. Show off your Joie de Vivre this summer! Get 20% off Le Jacquard Francais, excluding tea towels, custom sizes, and custom work. Get a free Heart Toasting Flute ($135 value) when you complete $500 or more of Michael Aram products from your gift registry. Create your registry now. Get 10 Points per $1. Earn more points by connecting with us or shopping with our partners. Redeem for great gifts and rewards. Sign up below or find out more. SIGN UP BONUS:: Get 100 Points for signing up and 1,000 more Points for joining our e-mail list! If you have an account with us, please enter your email and password below. If you prefer not to upload your resale certificate, you can fax it to 1-310-667-8566. You've been signed up to Gracious Style Rewards and now have points. This image is from the Swan Black Salt Cellar collection. 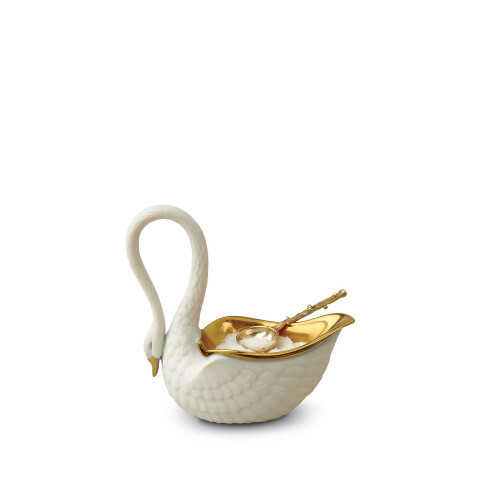 L’Objet Swans proudly nod to antiquity, with an unmistakably modern grace. From the hand-gilded 24-karat gold of the bowl, to the silky feathers on the magnificent curve of its neck, each swan is a singular and exquisite work of art, sculpted and finished entirely by hand. Please allow two weeks for delivery. Designed by Elad Yifrach in the U.S.A.
March 7 - Why Are You Seeing Enamelware Everywhere?